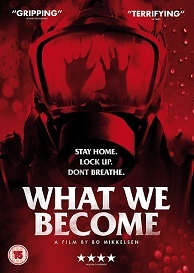 What We Become is out on DVD on 20th February and to celebrate we have a great competition for you and 3 copies of the DVD to give away. The feature filmmaking debut from Bo Mikkelsen, WHAT WE BECOME is a tense post-apocalyptic zombie thriller that’s the first of its kind in Danish horror cinema. A family of four is quarantined in their home as a mysterious virus spreads into town, transforming their friends and neighbours into zombies. As the military moves in to try and stem the outbreak, they are forced to the extreme in a struggle to escape alive. Also stars Ella Solgaard and Marie Hammer Boda.